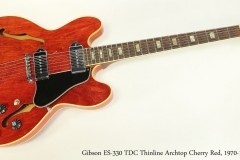 Gibson introduced the ES-330 in 1959, but as a replacement for the ES-225, not as a lower priced version of the new ES-335. In 1961 it was added to the Epiphone line as the ‘Casino’ where it achieved some fame in the hands of three members of The Beatles. The Gibson ES-330 is a fully hollow but thin bodied archtop model, available with one or two pickups, in sunburst, natural, cherry or walnut finishes. 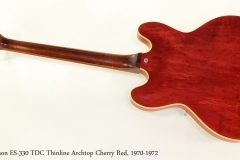 The example here is an ES-330 TDC – Thinline, Dual Pickup, Cherry finish. Typical of Gibson thinline electrics, the body is a Maple laminate. The neck is Mahogany with a Rosewood fingerboard. Originally, the neck joined the body at the 15th fret – and this carried over to the Casino models. In 1968, the 19th fret neck join was added as an option and this greatly increased access to the upper frets. The model was discontinued in 1970, but has been reissued a number of times. Here we’re looking at a Gibson ES-330 TDC, dating to the period of 1970 to 1972. It’s difficult to date it more accurately as production records from that time are not comprehensive. It may have been built in either Kalamazoo or the new Nashville plant. This guitar is in good working order. The neck appears to have been removed for purposes of a reset, and there is some overspray on the neck. The volute is rounded, but there was quite a bit of variation in volute shape during this period. It has the 19th-fret neck joint. The frets are original and quite low, but playable. The Gibson Deluxe Kluson-style tuners feature the plastic Keystone buttons and are not original. The rest of the hardware, including P-90s with nickel plated metal covers, and standard Gibson 2-pickup wiring using ‘Witch Hat’ knobs, is original. These are fun guitars to play, and sound great. A period grey hard shell case is included.